After doing the vast bulk of the research for the State, the Court now essentially holds (despite the absence of any actual litigation on the subject below) that case law from other jurisdictions demonstrates that grooming is such a well-established psychological concept that the State, as proponent of the grooming-based testimony here, need not have been required to prove it at all. Believing the trial record too bare for the Court to take judicial notice of the reliability of grooming-based testimony, Judge Price dissents. Judges Meyers and Womack joined the dissent. Irrespective of whether the study of “grooming” behavior is a legitimate field of expertise, I do not think [the expert in this case] was qualified to be an expert on this issue. He had no degree in any field of study involving human behavior, no specialized training in “grooming” behavior, and he did not show that the training and experience he did have enabled him to distinguish such behavior. Judges Womack and Price joined the dissent. This is not rocket science. It does not depend upon any scientific, technical, or psychological principles or methodology. This type of testimony does not depend upon educational expertise, any calculable rate of error, learned treatises, peer review, or any other esoteric skill. This is not even “soft science.” It is just “horse sense” expertise developed over many years of personal experience and observation. 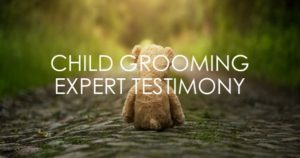 While they all seem to agree that “grooming” is an appropriate area for expert testimony, the lingering question (at least for me) is – What does it take to qualify someone to be an expert witness on child grooming? A question for a later day I suppose.